In 1780, allegedly under secret orders from General Washington, but as likely acting on his own, he traveled down the Ohio River to Kaskaskia. The success of General Clark’s capture of Fort Sackville at Vincennes inspired La Balme to attempt a similar feat against the British at Fort Detroit. 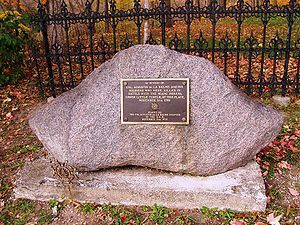 La Balme arrived in Kaskaskia as a French officer and was “greeted as Masiah” by the local Canadien residents, who had been living under British rule for over a decade. He gathered a list of grievances from residents living under the rule of the Virginians, which was to be delivered to the French Ambassador at Fort Pitt. 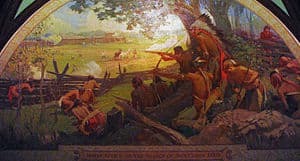 La Balme coordinated a diversionary attack against Fort St. Joseph, then began his journey to Detroit, recruiting militia from among the Canadian citizens of Kaskaskia, Cahokia, and Vincennes. At Vincennes, he started up the Wabash River with the expectation of adding to his force from the Canadian villages of Ouiatenon (present day West Lafayette, Indiana) and Kekionga (present day Fort Wayne). La Balme apparently expected Canadian residents at Fort Detroit to join him as well, once they arrived. The expedition marched under a French flag. La Balme’s force had little opposition until reaching Kekionga, where La Balme had planned to arrest Charles Beaubien, the British agent. Beaubien and many of the Miami were not there, however, so the force raised the French flag and raided British stores for over three days while awaiting reinforcements that never arrived. Upon learning of the return of a Miami hunting party to Kekionga, Le Balme departed to raid another trading post on the Eel River. Leaving some twenty men to guard the captured stores at Kekionga, his force marched out over the Eel River trail (the same trail Colonel John Hardin would follow ten years later). 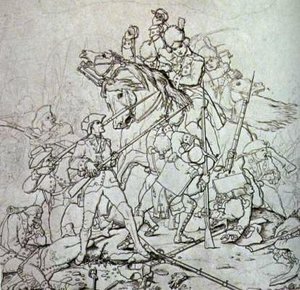 The Miami Indians, learning of the intrusion, destroyed the small group of men left at Kekionga. Chief Little Turtle, who lived in a village along the Eel River, attacked La Balme before he reached the Eel River trading post. La Balme and his men fortified themselves on the banks of the river. There remains some confusion as to the length of the battle; accounts of the siege vary from several days to several weeks. They were eventually defeated by an overwhelming force, and only a few survivors managed to escape. Augustin de la Balme died in the battle, which became known as La Balme’s Defeat. • For his leadership in this battle, Little Turtle gained a reputation that initiated a successful career as a war chief. • Although LaBalme’s expedition resulted in failure, it did cause the British considerable concern. 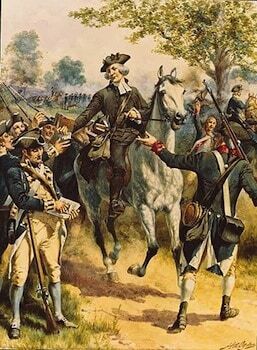 Major de Peyster subsequently deployed a detachment of British Rangers to protect Kekionga.